The Dog Helios 'Eboneflow' Mediumweight 4-Way-Stretch Flexible and Breathable Performance Dog Yoga T-Shirt was developed with premium Comfort and Flexibility in mind. The entire body features a specially configured Medium-weight elastic material that both cools and warms the body for year-round comfort and performance. This specially blended fabric features high-level properties of Flexibility for unrestricted Mobility and is also extremely Breathable and Permeable. The Exo-shell features 4-way stretch technology that moves in every direction. The Eboneflow Dog T-shirt also features banded elasticity around the sleeves and across the body for a nice almost tapered relaxed fit with added room for growth. Features Dual-Reinforced stitching at every seam for Durability with added reflective taping for night protection. 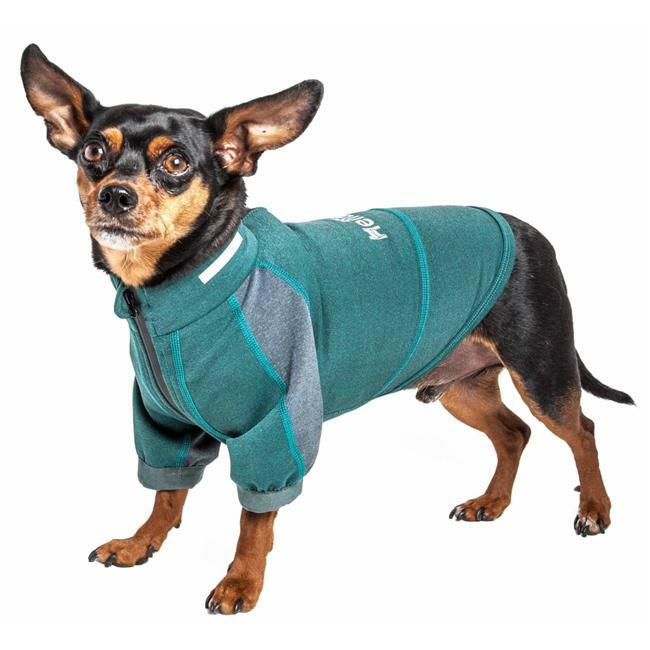 Additionally, this tracksuit features Quick-Drying technology that dries rapidly while offering Anti-Odor technology that prevents odor causing microbes. Assists with UV Protection against the suns harmful rays and fitted perfectly to help assist in containment or collection of shedded hairs. Features a fashion collar with a leash-slit along the back. Machine Washable.